Wheel loaders from Doosan, Komatsu America, Kubota Tractor, Caterpillar, Case, Volvo Construction Equipment, John Deere and New Holland. Lasers from AGL Construction Lasers, Apache Technologies, Topcon Positioning Systems, Leica Geosystems and AGATEC Construction Lasers. Large and medium excavators from John Deere, Case, Kobelco, New Holland, Hitachi, Volvo CE, Caterpillar, Komatsu America and Doosan. The new figure is derived from $500 million for the sewer overflow work plus $150 million for other mandated sewer and storm-water improvements, inspections and maintenance work needed to comply with the federal Clean Water Act. Aries Industries, with the additional expertise of Avanti International, Logiball and DeNeef and in cooperation with the University of Houston's CIGMAT grout specialty engineering group, has announced two workshops to take place in mid-January 2011 in Pompano Beach, Florida. The workshops are a Refresher Course for Sewer System Managers, Specification Writers and Inspectors on Jan. 18, and the three-day Sewer Infiltration Control Test and Sealing Equipment Seminar for Operators and Inspectors Jan. 19-21. The city of Akron, OH, has been federally mandated to improve its sewer system to help curtail overflow over the next 18 years at a cost of $650 million. The city previously had estimated the work would cost more than $500 million. The city of Richmond, British Columbia’s Engineering and Public Works Department has recently been selected to receive two national awards sponsored by the Canadian Public Works Association (CPWA) for their 2010 National Public Works Week (NPWW) campaign. The Trenchless Technology Center (TTC) at Louisiana Tech University recently hosted a delegation from China’s largest petroleum pipeline construction and engineering firm to share information about technologies being developed at the University, exchange ideas, and to lay the groundwork for possible future collaborations. EPA Region 7 has issued a pair of administrative orders to the Missouri Department of Transportation (MoDOT), citing multiple violations of stormwater permits that were issued for state construction projects along U.S. Highway 54 Expressway in Camden County, and U.S. Highway 67 in Wayne County. Jim McCullough, CEO and president of CNH Construction, which offers Case, New Holland and Kobelco branded construction equipment, testified on Sept. 29 before the House Transportation and Infrastructure Committee to report on progress thus far of the American Recovery and Reinvestment Act of 2009. The China International Trenchless Technology Conference & Exhibition (Trenchless Tech) will be held April 16-17, 2011 in Wuhan, China. Sponsored by the China Society Trenchless Technology and hosted by Shanghai Kexi Cultural Exchange Co., Trenchless Tech is geared for technicians and companies engaged in trenchless technology, pipeline and environmental engineering. The U.S. Environmental Protection Agency (EPA) is issuing a Clean Water and Drinking Water Infrastructure Sustainability Policy with the goal of increasing the sustainability of water and wastewater infrastructure in the United States. Communities across the country are facing challenges in making costly upgrades and repairs to their aging water infrastructure, which include sewer systems and treatment facilities. The new policy is part of EPA Administrator Lisa P. Jackson's priority to protect America's waters. Investigators, including the National Transportation Safety Board, are looking at whether repair work on a sewer pipeline close to a gas transmission line was responsible for a deadly explosion that shook a San Bruno, CA, neighborhood on Sept. 9, killing four people and injuring several others. New Jersey Natural Gas (NJNG) announced Oct. 22 that it has submitted a filing with the New Jersey Board of Public Utilities to continue its Accelerated Infrastructure Program (AIP II) and expedite a number of its previously planned replacement, reinforcement and expansion projects. NJNG is proposing to spend approximately $52.2 million on nine additional capital projects in Monmouth, Ocean and Morris counties. Sewer lines will soon be getting a major overhaul in the city of Fort Worth, TX. The city council approved a $446,192 engineering contract with White Rock Consultants to begin work on the new improvement project. Fort Worth is paying for the project using money already budgeted in the Water and Sewer Fund. The Northeast Trenchless Association will be hosting its Annual Training and Development Seminar on Jan. 17-19, 2011 at the Crowne Plaza Boston North Shore in Danvers, MA. Open to members and non-members, the meeting will include a multi-tract conference session. The Vanair Air N Arc 300 ALL-IN-ONE Power System offers a 40 cfm rotary screw compressor combined with a 7kW Generator, 300 amp Welder and Battery Booster in one compact footprint. Water is one of the enemies of long-life in primary cable, as water entering the cable core can lead to premature failure. A new feature has been added to the Telogis Fleet vehicle management application: the Field Management Co-Location Report. VUEWorks 2010 offers a major upgrade of its map-centric, web-enabled, GIS-integrated work order and asset management software. The McElroy PolyHorse can reduce labor expenses, provide a less hazardous working environment and enhance productivity up to 150 percent in some instances. The productivity tool can be used with 3-inch IPS through 20-inch OD (90 mm to 500 mm) polyethylene pipe. Super Products LLC has produced several new product literature pieces including a brochure featuring its line of Camel sewer and catch basin cleaners as well as spec sheets for its Supersucker industrial vacuum loaders and its new Mud Dog 650 hydro excavators. Digital Control Incorporated (DCI) has introduced the DigiTrak F5 locating system, the top-of-the-line model of the company’s new F Series horizontal directional drilling locating and tracking equipment. Each F Series model incorporates DCI’s successful Eclipse tracking technologies, including DCI’s patented 3D antenna technology, target-in-the-box locating and intuitive picture-driven menus. Laney Directional Drilling Co., a leading provider of horizontal directional drilling services to the energy, telecommunications and infrastructure sectors, announced the appointment of Kevin R. Fox as chief executive officer. Greg Jeter has joined American Augers in the position of International Territory Manager. Advertisers from the print edition of underground Construction, November 2010, Vol. 65 No. 11. To enhance services to customers, ISCO Industries, a Louisville, Ky.-based distributor and fabricator of piping products, is building a 40,000 square foot, 10-acre distribution facility in Kingman, Az. with the intent to employ up to 30 people in the area. When faced with a project that is 133 miles long, spans two states and dozens of counties and features a tight schedule, logistics can be a serious foe. Communicating to many design team members and being responsive to the many challenges encountered in the field only complicate the efforts to successfully complete a project on time and on budget. Developing organizational and coordination skills into a serious strength and planning appropriately are paramount to operating efficiently, performing well and providing quality results. As of mid-year, international/offshore reports show planned pipeline miles remain higher than actual pipeline construction mileage. Figures show the international sector accounts for 81,752 miles of crude oil, natural gas and refined products pipelines under construction and planned. Of these, 50,355 miles represent pipelines in the feasibility and front end engineering design phase while 31,215 miles account for pipelines in various phases of construction. A small, high-tech Ohio business has developed technology that monitors temperature readings along a full segment of pipe during the curing of the CIPP (cured-in-place-pipe) lining process. The procedure uses sensors strung by cable inside the pipe to be relined before the liner is inserted into the pipe, explains Jack Conte, president and chief executive officer of Zia Systems LLC. Mears Group Inc. completed in April a 7,400-foot horizontal directional drilling bore in Jacksonville, FL, a design-build project that allows a regional energy producer to expand its natural gas pipeline to serve new facilities. To complete the project, Mears drilled a 7,400-foot pilot hole 130-feet beneath the St. Johns River bottom to install the 16-inch steel pipe. It is an essential link in a 50-mile pipeline that ends at the Jacksonville Electric Authority (JEA’s) Greenland Energy Center. Construction on TransCanada Corporation’s long-distance, large-diameter C$5.2 billion Keystone crude oil pipeline reaching from Canada’s Alberta oil fields to markets in the U.S. Midwest is grinding to completion after more than two years of intensive construction activity. An expanded Damage Prevention & Safety (DP&S) Conference again will be a part of the 2011 UCT (Underground Construction Technology International Conference & Exhibition) scheduled at Houston’s George R. Brown Convention Center Jan. 25-27. Two days of educational sessions are scheduled for Tuesday, Jan. 25, and Wednesday, Jan. 26, with a day-long Staking University locator certification seminar on Thursday, Jan. 27. Sault Ste. Marie, MI, like so many other communities, is in the midst of storm-sewer separation upgrades. For many cities, that can mean miles of new pipe or upgraded utilities. Sault Ste. Marie has a unique challenge in that its historic downtown area is essentially an island, with the famous Soo Locks closely adjacent to the excavation area. When horizontal directional drilling (HDD) professionals discuss the size of an HDD rig, they usually refer to the maximum pullback force the unit can develop. The most common industry standard for a large directional drilling unit is defined as having a minimum of 100,000 pounds of pullback force. In addition to pullback, the most common specifications used to categorize HDD equipment are rotary torque of drill stem, rotation speed and the size of drill pipe. In this issue, Managing Editor Rita Tubb provides a round-up of oil, gas and product pipeline construction currently under way or projected around the world. It’s a reduced number, as expected, compared to recent years. However, it is a very realistic number as the “pipe-in-the-sky” projects that are inevitably thrown about during boom times have been dropped. The remaining projects are considered solid with a strong chance of coming to fruition. The numbers lead us to anticipate a reasonably healthy pipeline market going forward. 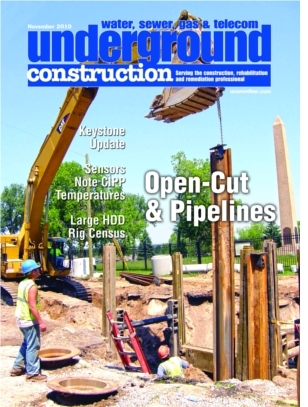 The Construction Writers Association (CWA) recently named <em>Underground Construction</em> Editor Robert Carpenter as winner of the 2010 Boger Award for the year’s best editorial. He was honored for his editorial that appeared in the August 2009 issue titled: “<a href="http://undergroundconstructionmagazine.com/price-free-money">The Price Of Free Money</a>.” He received the award at a special dinner during the CWA’s annual convention in Chicago. RE: <a href="http://undergroundconstructionmagazine.com/social-justice-pipelines">Social Justice For Pipelines?</a>, <em>Underground Construction</em>, Sept. 2010 While I admire your passion, I feel you left one important point out, and that is that all too often we are our own worst enemies. Congress may vote during the lame duck session after the November congressional elections on the biggest pipeline safety bill since the 2002 amendments established integrity management programs for distribution, transmission and hazardous liquid pipelines. Then again, a major reform bill may be delayed until the next Congress.